Symco Group is an authorized reseller for the complete line of IMConnect (formerly Intelmail) solutions. These solutions include customized inserting solutions, input channels, card mailing systems, stand alone mail solutions and software solutions dedicated to the mailing industry. Interested in adding an input module to your swing arm inserter? How about intelligence and reporting? If you want to upgrade your existing equipment or add additional capacity to your operations, contact Symco Group today at info@symcogroup.com or 800-878-8002. The A Feeder is specially designed to be used as a unit or in a stand-alone full system configuration linked on-line with other Feeders and inserters, for any complex mailing application requiring flat sheet processing. The A Feeder is driven and controlled by the IM Connect real-time operating system software and is capable of reading and feeding cut sheet A4 (8 1/2 x 11 inch) forms at the rate of 80,000+ per hour, processing via OMR/Barcode or by direct link to data base. Use on-line with suitable inserter to feed and accumulate sets of up to 30 sheets, ready for inserting into envelopes. Use off-line to match and count pages in large multiple sets for hand insertion (with sub-set facility) or with an optional drop-stacker for larger volumes. 80,000+ A4 (8 1/2 x 11 inch) sheets p.h. 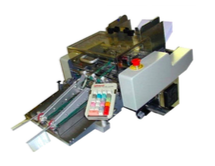 The Input Channel AA is a high speed Feeder Double Accumulator that can feed and read flat or half-folded sheets / coupons at speed of over 400 MPM (80,000 A4) print forms per hour. This modular mobile unit, operating stand-alone or integrated into a system, can feed, read and accumulate variable multiple sets of 1-15 flat sheets in cut sheet and/or continuous forms. This Input Channel is most suitable for applications requiring continuous high multi sheet sets processing. 70,000+ A4 (8 1⁄2 x 11 inch) sheets p.h. 220 – 250 volts, 50/60 Hz single phase max. 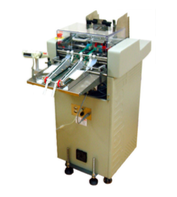 AM – Accumulator Mountable The AM Feeder is designed to be mounted over the infeed track of a plastic wrapping machine or finishing machine, such as a binder or collator. Multiple page sets up to 25 pages can be accumulated and fed into the work stream. The IM Connect system operating software provides control of the wrapping or finishing machine, and ensures that all documents are in order and accounted for. Options can enable insert selection, diverting etc. The AM Feeder can be moved from machine to machine, if the machines are suitably prepared. Use to feed address sheet onto product to be wrapped or add on-sert material to the pack. Use to include variable or fixed count personalised document sets or material to each pack. The VAF Feeder is specially designed to be used as a unit or in a stand-alone full system configuration linked on-line with other Feeders and inserters, to process any complex mailing application. 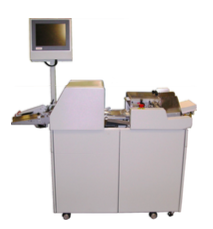 The VAF Feeder is driven and controlled by the IM Connect real-time operating system software and is capable of reading and feeding cut A4 (8 1/2 x 11 inch) sheet forms at the rate of 80,000+ per hour, processing via OMR/Barcode or by direct link to data base. Use on-line with inserter to feed & fold sets and envelope each set with selected inserts matched or unmatched. Use on-line with inserter and a 1-up or 2-up continuous forms attachment to convert continuous forms into cut sheet and process as above. 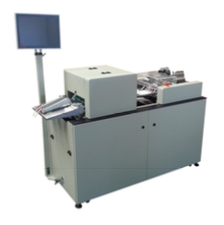 VAF Pro Input Channel is the fastest Variable Document Feeder Accumulator Folder that can operate stand-alone or be integrated as part of a system configuration with other intelligent or non-intelligent machines for processing all types of mailing application. This machine is controlled by real-time operating software with Windows based interface, capable of feeding 400 m/min, over 75,000 A4 Portrait sheets per hour by reading OMR/BCR/OCR codes as well as with a direct link to database. 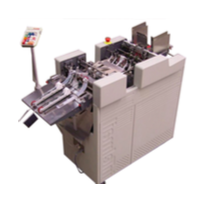 VAF Pro is supplied either with a 2-plate or 4-plate* folding head for processing sets of 1- 8 sheets letter (third) fold or 1-12 sheets half fold. VAF Pro can be configured on the field to read all types of industry codes. VAF Pro is capable of generating reconciliation reports for every job processed. 75,000+ A4 (8 1⁄2 x 11 inch) sheets p.h. The DAF Feeder is specially designed to be used as a stand alone unit or in a full system configuration linked on-line with other Feeders and inserters, to process any complex mailing application. The DAF Feeder is driven and controlled by the IM Connect real-time operating software and is capable of reading and feeding two streams of pages simultaneously at the rate of 80,000 + pages per hour, processing via OMR or barcode or by direct link to data base. Use on-line with inserter to feed, match, merge and fold multiple forms from the top and bottom feeder, before feeding the folded sets into a suitable inserter or conveyor, eg 2 page letter and order form. Use in-line with inserter and continuous forms separator, to feed two streams of statement pages, one stream of continuous follower pages printed on plain paper and one stream of cut sheet colour printed and perforated statement header pages, matching and merging the two streams into variable multiple page sets, before folding the pages together. 80,000+ A4 (8 1/2” x 11 inch) sheets p.h. The Model XF Folder is designed to work inline with a suitably prepared inserting machine and inTelmail sheet feeder mounted at right angles. It can be used to reduce the size of a large document down to suit the carrier envelope size, both in width and depth. Typically it will accept a vertically folded document from a Model VAF feeder/folder, then fold this horizontally before feeding it into the inserting machine. 30,000+ A4 (8 1/2 x 11 “) sheets p.h.